DoMUS Apartments and the Milwaukee Public Library (MPL) Mitchell Street Branch have won Mayor’s Design Awards through the City of Milwaukee Department of City Development. 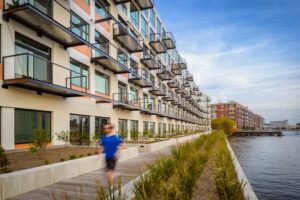 DoMUS Apartments, designed by HGA and developed by Mandel Group, is a new residential building adjacent to the Historic Marine Terminal Building along the Milwaukee Riverfront. Designed to reflect the architectural character of the existing brick-and-masonry commercial buildings in the Historic 3rd Ward, DoMUS completes an extension to the Riverwalk, one of the city’s premier public amenities. 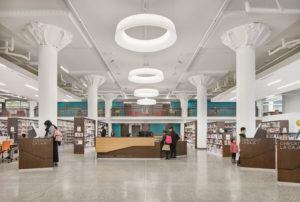 Mitchell Street Branch, designed by HGA and developed by Gorman & Company, transforms the former Hills Department Store, listed on the National Register of Historic Places, into a neighborhood destination and educational anchor. The restoration retains many decorative architectural features, including the plaster column capitals, historic stair railings, terrazzo floor, and mezzanine. Part of the MPL’s strategic plan to locate new branches within mixed-use developments, the Mitchell Street Branch occupies the first floor, mezzanine, and portion of the lower level of a mixed-use restoration that includes 60 market-rate apartments on floors two through five. Established in 1997, the Mayor’s Design Awards program recognizes restorations, new construction, and enhancements that add value to the urban fabric and surrounding neighborhood. The 2018 Mayor’s Design Awards were presented May 24, 2018, at the University of Wisconsin-Milwaukee School of Architecture and Urban Planning. For more information, visit the City of Milwaukee Department of City Development.